(CNN) – The Obama administration is eager to defend progressive efforts to dismantle conservative causes, and it stands ready to "shut up anybody who challenges it," Senate Republican Leader Mitch McConnell said Friday in a hard-hitting speech. Using the recent Internal Revenue Service controversy to back up his claim, McConnell accused the Obama administration of pursuing an agenda that aims to "stifle speech" and enact a "culture of intimidation." "Our ability to freely engage in civic life and to organize in defense of our beliefs is still under coordinated assault from groups on the Left that don't like the idea of anyone criticizing their aims, and from a White House that appears determined to shut up anybody who challenges it," he said at the American Enterprise Institute, a year after he made a cautionary speech about the administration at the same conservative think tank. The IRS admitted to unfairly targeting conservative groups seeking tax-exempt status starting in 2010, but officials say the action was a bureaucratic shortcut in its Cincinnati office. They maintain that it was not done out of political bias. Republicans, however, argue the scandal is proof that the administration and progressive groups have been trying to clamp down on those who disagree with the president's agenda. Some have gone as far as saying the order to target conservative groups at the IRS came directly from Washington, not Ohio. But congressional investigators have not produced evidence of any political dealing in the matter by the White House. For his part, McConnell said he doesn't believe President Obama "actually picked up a phone and told someone over at the IRS to slow-walk those applications or audit anybody." "But the truth is, he didn't have to," he added. "The message was clear enough." The senator from Kentucky, who's up for re-election next year, singled out union groups for conspiring too closely with government officials, resulting in what he described as oppression against the public. "This isn't done in the interest of serving taxpayers. It's done in the interest of fleecing them." A perfect example, he said, was the news this week that the IRS owes $70 million in bonuses to employees in the next several months. The agency says it's legally bound to pay the bonuses, if required by contracts worked out with the National Treasury Employees Union, according to a spokesman. It said it is acting under guidance from the White House Office of Management and Budget. "The IRS union is thumbing its nose at the American people," McConnell said. "All it cares about is helping union workers get theirs. It's pure arrogance, and it reflects a sense of entitlement better suited to an aristocracy than to a nation of constitutional self-government." The White House hopes the media loses interest in the story, he said, but "we can't move on." "Let's not lose sight of the larger scandal that's been right in front of us for five years: a sitting president who simply refuses to accept the fact that the public isn't going to applaud everything he does," he said. "The only way to beat a bully is to fight back." White House spokesman Jay Carney told reporters Friday that acting IRS Commissioner Danny Werfel had indicated he would complete an initial report on the agency ordered by the White House by the end of June. When he took over leadership of the IRS on May 22, Werfel was given 30 days to provide his review of the agency. - CNNMoney's Jennifer Liberto and CNN's Tom Cohen contributed to this report. If conservatives want to challenge the President, or "progressives", fine. Just don't try to send me the bill for their stupid tv and print ads. It's so hilarious when Republicans try to play the victim. Hello Sen. Turtle!....you're feeling intimidated? Your promise to the president before he ever got a chance to warm up his seat in the WH was to assure his failure...and now you want others to feel your pain and victimization? LOL...ok, Sarah Palin is going on jeopardy and the best she can do is spell her own name correctly. Republican's talking about bullys. Reminds you of Nixon saying "I am not a crook"
Mr. Obama brought in an administration of competence and far greater accountability compared to what we had. He is a Columbia and Harvard grad. He and his team have powerful credentials, powerful experience, and powerful confidence in their abilities, the morality of their convictions and their solid electoral mandate. [Romney was destroyed]. That is the funniest thing I have read on here lately, have you been paying attention??? Obama has NO integrity!!!! All he cares about is power and control!!! It is hilarious that when Bush passed the numerous policies that were very controversial you liberals screamed loud and clear but when Obama continues them or extends the law, he is the man!!! Hypocrisy at its finest!!!!!!!!!!!! Amazing how McConnell's head does not explode from sheer cognitive dissonance. Unless of course, he believes his own giant steaming mountain of cow patties. 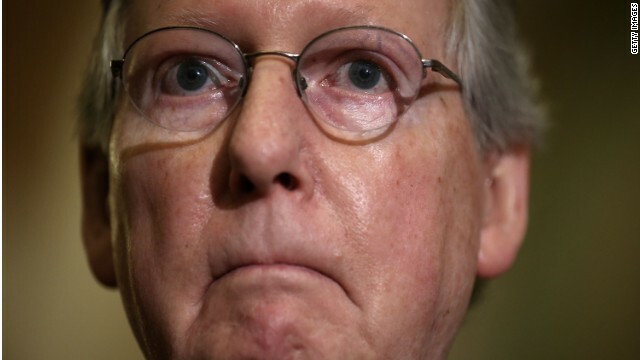 Hey for the folks that are nincompoop enough to agree with the "Mitchy the Senate Turtle"....please tell us what this waste of space has done for our tax dollars over the past 5.5 yrs, other than declare his only job being to make Pres. Obama a one termer. And be reminded only a fool would try to justify that as being a meaningful accomplishment. Since many of you have done that already, I guess that proves the point...as long as there are knuckle draggin idiots in this country the GOP/Tea Tards will have a fan base. STOPPED numerous bills that your disaster of a president tried to pass, if many of them would have passed, our country would be even further in the toilet, and for that I think him!!!!!!!!!!!!!!!!!!!!!!!!!!!!!!!!!!!!!!!!!!!!! .......and his GOP gun totin' racist sign postin',...banjo playin' riot of GOOFBALLZ................ isn't? McConnell: Our number 1 priority is to make sure Obama is a one-term president....no matter how obstructionist or incompetent we get as your U.S. congressmen.